First mentioned in the Domesday Book and belonging to the son of William the Conqueror, Hartwell has a rich history which touches upon more than England alone. It was here that the exiled Louis XVIII held court between 1809 and 1814, and it was within the library that he signed the constitutional document confirming his accession to the French throne. His and Queen Marie Josephine de Savoie’s presence at Hartwell is remembered with their portraits overlooking the main staircase. It is also of historic interest to note that the existing house was originally built for the Hampden and Lee families from whom General Robert E Lee was descended. Guest rooms at Hartwell are divided between the main house, the converted coach house (now known as Hartwell Court), and The Old Rectory. These include double, twin and single rooms, as well as four-poster suites once used by Louis and Queen Marie. 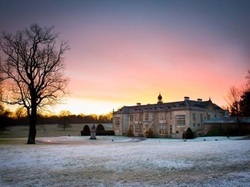 Hartwell House boasts its own spa which includes a pool and steam room, while dining options are to be found within both the spa and the main house. The property itself is leased to the National Trust. Reviews and Booking. Please note that nightsinthepast.com plays no part in the actual review, booking or reservation process for Hartwell House or any other accommodation. Costs for maintaining and developing Nights in the Past are met solely by it being the last referring site to our partners which results in a completed reservation.